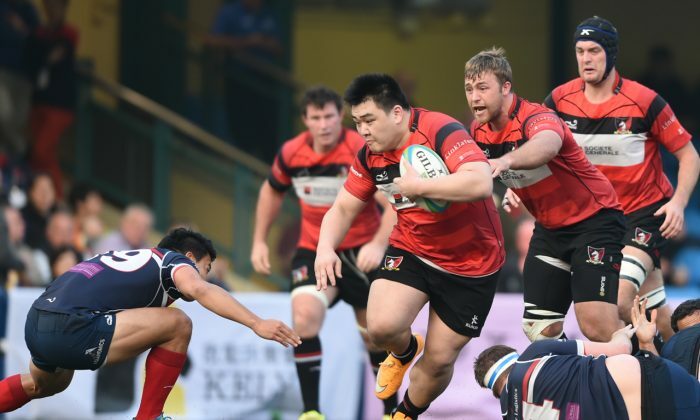 In Round 12 of the Hong Kong Rugby Union Premiership last Saturday Jan 17, Leighton Asia HKCC continued their unrelenting drive for the Premiership 2015 Title with a 43-5 win over Abacus Kowloon to take them onto 47-points. Second placed Bloomberg HK Scottish found a fired up Societe Generale Valley too hot to handle losing 42-12 and the Broony Quaich trophy leaving them 7-points adrift of the leaders and only 2-points ahead of Valley. The final match run-in looks fairly even for both Valley and HK Scottish. Valley play NATIXIS HKFC at Sports road this coming week, followed by leaders, HKCC and then Borrelli Walsh USRC Tigers in the final week of the league. HK Scottish meet Kowloon at King’s Park next week, then play HKFC before facing HKCC in the final match. The matches for Valley and HK Scottish with HKCC look like being crucial in deciding the 2nd and 3rd places—important to the Grand Championship Semi-final pairings. HKCC with a match still to play at home against bottom of the table Tigers sitting with a 7-point lead look secure in finishing top of the standings for the second year running. Although theoretically it is possible for HK Scottish and Valley to still head the table such a happening is unlikely. HKFC had a comfortable 24-5 win against Tigers last Saturday to further consolidate their grip on 4th place now on 26-points, 10-points clear of Kowloon. But with Kowloon still to play Tigers and two difficult games for HKFC against Valley and HK Scottish over the next two weeks the final HKFC match against Kowloon could see the two teams level on points, but HKFC’s superior points difference should still see them through.